In Britain, they have herring gulls. They have a piercing, laughing call that instantly evokes in the sense of the seaside. One day, as a male herring gull swooped down to take a French fry out of his hand while his back was against the railing. As he looked into the cold eye of the seagull he thought they were definitely bigger and a bit scary up close! Anyone eating fish and chips outside on the railings of a seaside promenade is definitely running the risk of losing their meal, not to mention the scaring of any chip-holding small children! With the advent of large landfill sites, gulls have migrated inland. Consequently, you have them at the university, where they play on the tops of the tall, cliff-like buildings, swooping down into the midst of the people there, and onto the scraps that are dropped or left out by the unsuspecting. 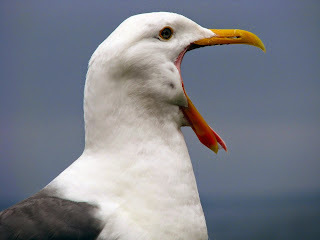 Herring gulls are opportunist scavengers with a strict pecking order, and they are ruthless bullies. They play "Who is the king of the castle?" To see who is the biggest and meanest. To the winner go the rewards. In similar manner, the vultures Jesus mentions fight over carrion in the Middle East. God wants us to avoid the unnecessary contests in thought, word, and deed. 1 Corinthians 3:3 - For you are still of the flesh. For while there is jealousy and strife among you, are you not of the flesh and behaving only in a human way? We have nothing to prove because we all receive what we have by grace. We rejoice because the Holy Spirit abides in us. Yes, while it is still light, we can proclaim His kingdom by being faithful and obedient to His call in thought, word, and deed. Dear Lord, help us not envy others, or seek to climb the ladder, or dwell with our pride. Grant us with a renewed, godly wisdom, joy, and humility. In Jesus' name, Amen.